Read the instructions posted on this page to learn how to access the official Virginia Living Museum job application (online version). Numerous current openings can be applied for by creating an online account and going through the application process. The instructions posted below detail how to create an account, search for current openings, and fill out/submit an application. It should be noted that although the museum accepts offline applications, it’s recommended to apply online. 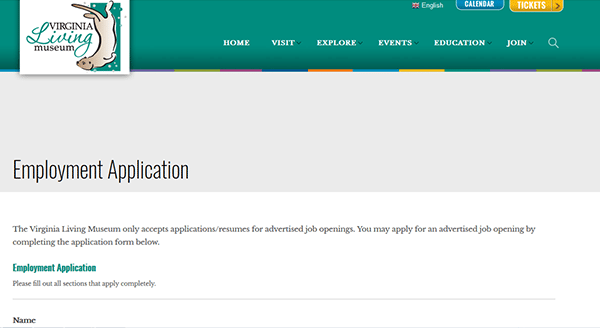 Step 1 – The first step of the online job application process is to go to the museum’s main employment page. Press this link to have the employment page load in a new tab/window. 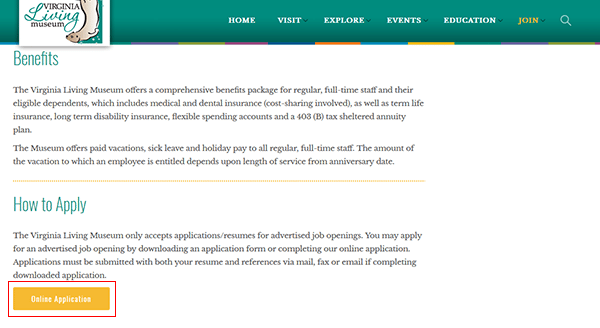 Note: If you want to go directly to the employment page (within this current window) then simply scroll to the top of this page and press the “Apply” button. Step 2 – Scroll down the page and click the “Online Application” button as outlined in red in the below screenshot. Have you ever been employed/volunteered here before? Do you have a relative currently employed by us?